Did you write the article on the Orion HT800HC? I have exactly the same problem with an Orion HT800HC and being a hobby mend it person, I opened the unit to have a look. The Problem: We have a lot of lightning storms here in central Hungary and subsequent short power cuts (anything between 5 minutes and three days). I can well imagine that when the power came back on after a recent storm, there was a power surge which went into the DVD player which was still switched on. Consequently my unit is now dead as a dodo! The Symptoms: No power indicated to me that there could be a problem with the primary board. In fact the soldered 2A fuse had burnt out, so I replaced it, only to find that this was a symptom and not the cause of the problem. Having soldered the fuse back in and on switching the unit back on I heard a pop and unfortunately realized that there was more to this problem. I removed the primary again and had a look at the rear side (with a magnifying glass). U1, R11 and R13 look burnt out and there are heat marks surrounding the soldering’s for the aluminum cooling element. Help: I don’t know what to do. The components are so small I can hardly see them never mind solder new ones in! Furthermore I don’t know if they too are just symptoms and not the cause! If I send you the primary would you be prepared to have a look at it for me? I am very willing to pay you for repairing it too. I hate to be beaten and I don’t want to have to throw the whole unit away. My primary is slightly different to the one you pictured. I noted your comment about badly selected capacitor ratings. I noticed that on my unit the earth wire from the front facial was connected to the wrong corner of the primary board (a non-silvered point) and was indeed too short to be connected to the GND point on the opposite corner. What do you make of this? Thank you for your email, Sorry for delay in responding. You have indicated that the machine could have been affected by the power surge, what happen during power surge is that the component are exposed to higher voltage than recommended. Usually the culprit is semiconductor and capacitors….in your case only the main capacitor which is rated 400 Volts (main capacitor only). 22uF/400V I am assuming you country use 240 volts otherwise this capacitor voltage rating could be 200volts in countries using 110 volts like USA. 1. When the main capacitor voltage is exceeded usually has physical signs, example the top silver top become swollen, even a slight sign is considered bad. Also note if at the button of that cap there is some oozing liquid. If none of the above symptoms then consider the capacitor is ok for now. 2. Semiconductor shorted- this one is the most likely culprit, by semiconductor I mean things like transistors, diodes, I.Cs = they have many semiconductors inside them and therefore they have high rate of shorting out. Now in your case your supply has a transistor (with 3 legs and bolted to a heat sink) this always short during power surge and therefore I recommend you change it even if it doesn’t show any sigh of stress. There is also another small transistor near that big one, one can change it too, it is recommended because sometimes its goes and other times it can survive. From my experience changing those 3 components always make the power supply to come up again. Here in our country these components are very cheap, in fact less than a dollar for all of them and hence it is very economical to repair than throw it away. What cause the fuse to blow? Fuses are safety components so when a fuse blows it means it has done his work. You should even congratulate it for job well done. 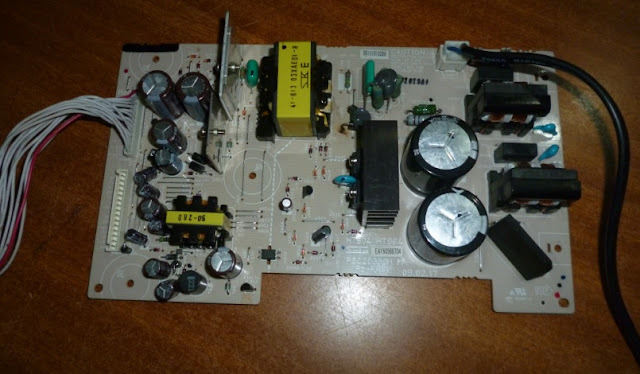 If you have problem with getting the exact fuse you can solder a very thing wire across the fuse on the underside of the board and it should serve the purpose. You have indicated that you are a hobby mend it person, that is very good I too started as a hobby but now I have seen it grow to a higher level. So I recommend you buy at least some tools like a multi-meter which is the eye of a technician, solder iron and solder wire. Sure you are right the board I have put on my blog is not the exact orion board but for the Lg DVd, I never had the opportunity to take the pic of the orion one but the point I was trying to drive home is the same because these things have the same principle of operation and if you understand one you have got all. If the machine was working okay before the power surge then it means that capacitor has no much effect on the circuit working and therefore you can ignore it for now but there is also no harm in apply some solder on it or replace it altogether. You have hinted that there is a lot of power cuts due to storms around your area, usually a coin has two sides same case apply to life issues whenever you see a problem there is always the other side of it which is always opportunities. To me I see lots of repairing business around your area, you can start as a hobby repairing yours, next for your neighbors’, friends and within no time the market increases and money will start looking for you. If you change the component I have just told you and the machine doesn’t get up please feel free to let me know and I can give you another option. Note: to change the transistor on the heat sink you have to remove the heart sink together with the transistor. Remove the bolt and replace the new transistor, fix it again to the heat sink and solder it to back the circuit board. I am in Manchester at the moment working on something else. I do appreciate your help on the DVD and I also understand your comments, however I could hardly even see the components that had burnt out (without a magnifying glass) never mind replace them. Would it be possible to send you the primary board and some dollars and you fix it for me? I get your point, can you send me the pictures of the board first for me to scan, I have no problem in repairing for you but let consider if the whole project is economical...i mean sending the thing here and back. Otherwise components here are very cheap. I will be in Manchester for the rest of this week and in Bradford until Wednesday of next week. Back in Hungary next Thursday. 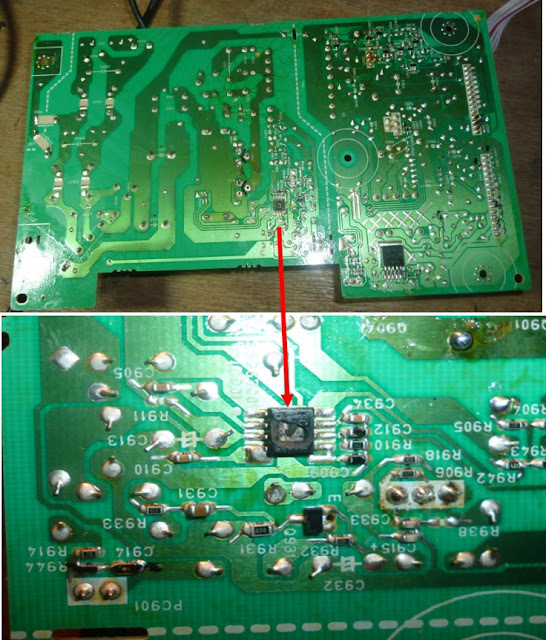 I have a professional digital camera and will take clear and high resolution pictures of both sides of the primary board. Take a look at it and let me know what you think. The 800HC is a home cinema with surround sound and has a USB socket at the side. The setup is part of my home system and I really want to keep it. It is just over a year old and cost 50EUR new on offer at Tesco, so I could buy a new one but I know what is wrong with it and I hate to be beaten and don’t like throwing things away. I will weigh the primary and find out what it costs to send this weight to Kenya. I assume the return postage would be similar. As you said parts are not expensive so one or more components more will not kill the project. You can have a look at the pictures and have a guess at the parts and of course your time and we can decide then to proceed or not. Thank you for your email, I concur with you that it is not prudent to throw away things every time they have a problem. Your zeal not to take defeat sitting down is also very commendable altitude of highly effective people. Most of electronics problems have simple solution and therefore throwing things away every time they develop a problem is simply not being fair to them and us too. I noted your intension of sending the board here in Kenya but I was wondering about the charges but if you find them to be reasonable please feel free to send it in and I will do the repair absolutely free- you will only pay the postage. That is a very welcome offer. I will contact you next Thursday as soon as I get back to my desk in Hungary. For those who are asking for the photo of this article i have gathered from my computer something which sounds like the scenario Andrew is talking about. 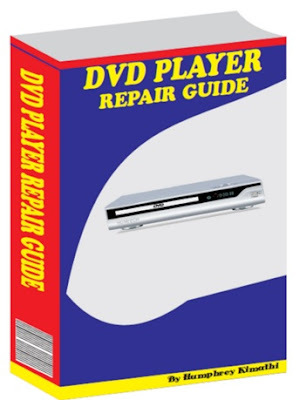 Humphrey Kimathi is Author best selling ebook" DVD player repair guide"
Andrew should post the picture of the power section if he can. Hi Phillip, By the time of publishing Andrew has not send in the photo.